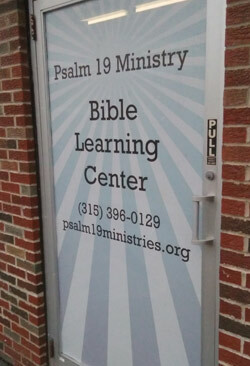 E-Mail: 6136 S. Salina St.
For Sunday morning worship, St. Andrew's Anglican Church meets in the Psalm 19 Ministries building at 6138 South Salina St., Syracuse, NY 13205, right next to our ministry center where you see our sign. We are right across the street from Aldi's, OIP & Colonial Laundromat in Nedrow at the corner of Lindbergh Road and S. Salina St. Look for the sign "Bible Learning Center" on the building and the "St. Andrew's Anglican Church" sign on the sidewalk. We are extremely grateful for the hospitality and kindness shown us by Iris Godfrey of Psalm 19, in giving us a place of worship. There is handicap parking directly in front of the building or in the parking lot to the south. Walk through the door and you will be amongst friends. St. Andrew's Ministry Center is located at 6136 South Salina Street in Nedrow -- immediately next to where we worship on Sundays. We hold Sunday School classes, dinners & parties, meetings and special worship services and Holy Week week services.